In late April, Venezuelan police were trying to disperse crowds in Caracas who were demonstrating against President Nicolas Maduro’s dictatorship when a tear gas canister was shot, point-blank, into the chest of 20-year-old Juan Pablo Pernalete. Have you ever seen a tear gas canister? Some resemble large bullets, about 2 centimeters in diameter, metallic, with a sharp point. Authorities shoot them toward empty spots in a crowd; the canisters then explode and spew a cloud of noxious gas. Juan Pablo was an outstanding basketball player. He competed in Brazil, Argentina and Chile. His goal was to play in the NBA here in the United States. His bedroom was full of medals and trophies. Translation: Juan Pablo was killed by a tear gas canister aimed directly at him — and only the National Guard uses such canisters. 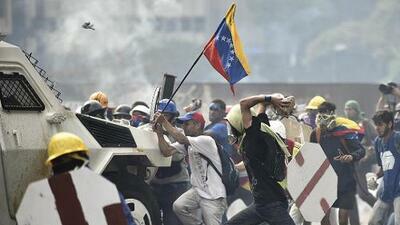 Juan Pablo’s death is one of dozens that have occurred in Venezuela over months of protests. For the moment, it seems impossible that things will ever go back to a precarious normal. Nothing is normal in Venezuela these days. Of course, the demise of the dictatorship is one plausible scenario, given all the pressure that the unrest puts on the regime. Even the Chavistas don’t want to see any more young people killed. But another scenario, both plausible and brutal, is an all-out massacre at the hands of the regime, followed by a bullet-based peace. When a government targets its young citizens, they will take it upon themselves to change the government. In the Venezuela that Juan Pablo and many others imagine, there would be no room for Maduro, Cabello and their thugs. Before taking office, politicians customarily sell their vision for their country to their fellow citizens. Maduro, however, didn’t have to. He was the handpicked successor of Hugo Chávez, the late Venezuelan strongman. Maduro’s only promise when he came to power was to leave things as they were. But the country is slipping through his fingers. Venezuelans now have a decision to make: Which country do they prefer? Maduro’s or Juan Pablo’s? Tens of thousands — maybe millions — have already made their decision and taken to the streets.